Elderly members of a family are often diagnosed with incurable medical conditions, and coping with such a situation becomes a traumatic journey for both the patient and their families. However, it’s not just elderly family members but people of any age can suffer from such non-communicable debilitating diseases and would require holistic care at home. Cancer sufferers account to be the highest among them. As per a recent World Health Organization (WHO) report, the population of UAE (United Arab Emirates), which is one of the GCC (Gulf Cooperation Council) countries, is around 9,200,000 million. Out of which, only 15 per cent are considered as Emirates nationals, the rest are expatriates. The vast population of expatriates from diverse nationalities of the world is especially strong in cities like Dubai and Abu Dhabi. No wonder then that with such a diverse mix of population, which thrives on its working professionals, and expats staying away from their extended family or support group, home healthcare in Dubai especially to manage symptoms related to pain is of paramount importance. In the recent years, there has been a lot of emphasis from the health authorities of these cities to actively start bringing palliative care services into a more structured, and standardized module to help minimize the sufferings of those involved. Given the cultural and linguistic barriers, often patients suffering from critical conditions lead an isolated journey. This should be the primary focus of modern-day, updated palliative nursing care provided by nursing homes. They should address the issues of psychological demotivation, seclusion or loneliness arising from cultural gap, unstructured palliative care modules failing to address diverse timings and weekend-based needs of many expat families and above all, the dignity and kindness that all such patients deserve. Moreover, it is often the wish of such families and patients that they spend the last leg of their journey of life in the familiar comfort of home, which is often a keeper of memories. Effective pain alleviation, proper assessment and management of pain symptoms and somatic symptoms, handing depression among patients and easing out their daily life are the core areas of palliative care that are being addressed today. What are the Advantages of Home Palliative Care? Palliative care also covers alleviation of pain and symptoms and suffering from treatments or surgery. At Nightingale Dubai, our holistic palliative care at home aims to supports patients and families through sensitive and advanced caring. Palliative home care services also ensure that frequent hospital trips are minimized and medical care expenses are cut down considerably. This often leaves families with more savings to further invest in quality palliative care nurses at home. Alleviation of pain and uncomfortable symptoms: Pain due to destabilizing diseases are commonly experienced by patients. In cases of surgeries and treatments of non-communicable incurable diseases that involve crucial bodily pain, palliative care primarily involves recognizing symptoms of pain, relapse and alleviation through proper monitoring, administration of prescription drugs and routine check-up of body rashes, bed sores etc. Administration of medication as needed (orally, through IV or injection): In fact, administration of medicine–oral or through IV or injection on a proper, timely basis and also maintaining proper clinical hygiene of the equipment and those bodily areas is a vital component of palliative care. Coordinating with doctors regarding daily upkeep and care management: This is another major responsibility of palliative care nurses at home. Regular communication with the concerned doctor regarding the stability of patients, observing and reporting of symptoms and contrary indications on a priority to help arrest complications right at the onset fall under the purview home care nurses. Devising a daily routine around the patients: Once a comfort level is reached with the patient and the family, home healthcare nurses should be able to devise a sustainable routine that takes care of the patient’s daily dietary and medicine intake, fluid intake, sleep and rest, recommended exercises and engaging healthy activities like reading, listening to music, talking or any such activity that helps patients restore a balance of life. Providing assistance with difficult medical decisions: Providing guidance on taking important medical decisions like medicine dosages etc during the course of a day also comes under the purview of a medically trained palliative care nurse. Helping in daily activities: Assisting patients with day-to-day rituals of taking shower, toilet activities, taking meals, moving around, taking medicines, performing exercises–all have to dutifully performed by clinically treated palliative care nurses. 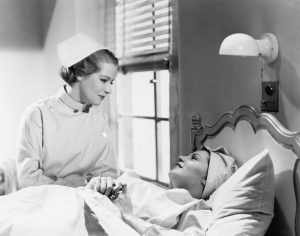 While performing all these chores, it is most important that the nurse maintains respectful distance and composure of manners such as not to compromise on the patient’s dignity. At Nightingale Dubai, we understand the critical as well as the delicate nature of palliative care services at home. Hence, our registered nurses are well-trained to provide positive counseling to patient at such a difficult and often destabilizing phase of their life apart from dealing with them with utmost care and respect. We understand that for a family to entrust invaluable members of their families to the care of a nurse at such a stage of their life must be fall of worries and guilt, and we only works towards filling that gap in an objective and yet homely manner.